So what is MyAlbum ? Runs under Windows 95/98/Me/NT4/2000/XP and Vista. Supported picture formats JPEG, BMP, PNG, GIF, animated GIF, TIFF, TGA, PCX and WMF files. Supported video formats AVI, MOV (QuickTime), MPEG (all the video formats supported by the Windows Media Player). Other format : HTML (IE 4 or above needed). Comment and keywords can be added to each picture. Searching on file name, comment or keyword. Full screen display, zoom, unzoom, fit to screen. Manual, automatic, random and multiple slideshow with background music and transition effects. Easy printing of the thumbnail pages and the pictures. Poster printing on several sheets of paper. Build contact sheets and HTML pages (online demos: Film strip, Automatic slideshow (IE 5.5+) and Metal). Easy convert, resize of the pictures. Special features for building CDROM album. Extracts information from images taken with digital cameras. Screen saver to play albums when PC is unattended. MyAlbum Unicode edition Version of MyAlbum supporting the Unicode character set (2.26 MB). Caution: Can only be used with Windows NT4/2000/XP/Vista. Unleash the power of MyAlbum with more than 100 scripts to download! Download the MyAlbum wallpaper (JPEG 1280x1024 - 154 KB). French version French speaking users / Utillisateurs francophones, téléchargez la version francisée. Language files (Translated user interface) - To be downloaded with the international version. Help Wanted ! Want to have MyAlbum speaking your own language? You can help the MyAlbum project by translating its user-interface into your mother-tongue. Just send me an e-mail to get the language development kit! "Whether you're just looking for an easy way to get all of your pictures into one place, or a way to create albums you can send off to annoy -- er... share -- with your family and friends, MyAlbum is the perfect tool." MyAlbum is the Most Downloaded freeware in the Image Cataloging category for the year 2002 at WebAttack.com. "Could you use a software photo album that can display nearly all image file formats and most video files? If so, you should investigate MyAlbum. MyAlbum does it all. It comes in English or French, and it's free. However, if you really like MyAlbum and would like to get free update announcements and extra support, you can register for $15 (or 15 Euros). This is probably all the slide show software you will need for quite some time." 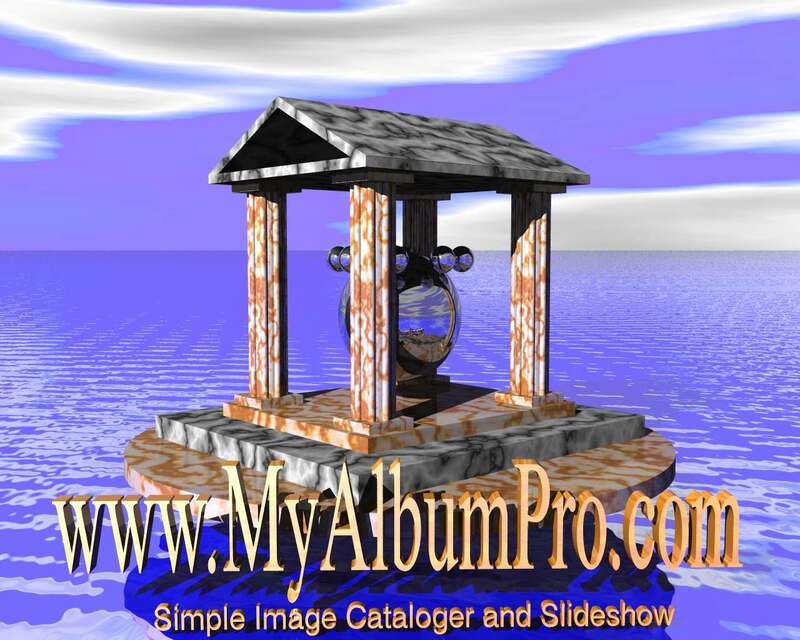 "MyAlbum is a simple (in look) graphic viewer but loaded with features. (...) Perfect for the home or even professional photographers. Supports a wide range of graphic formats." 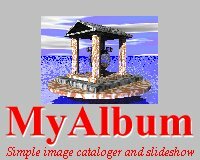 "Simple Image Cataloger and Slideshow" - that's the modest way French program author Pierre Meindre describes his MyAlbum image archiving software. In truth, however, it supports an outstanding range of powerful functions that go way beyond classical image collecting and categorizing. Corrections for display on interlaced 3D monitors. Improved sound synchronization when starting a slideshow. Correction: loading very large scripts was crashing the application. Correction in selecting items in the sheet layout editor. Support for "Deflate" compressed TIFF pictures. Correction : opening an album by double-clicking an album file. New volume parameters for the Play Commands: media can be played at a specified volume and the volume of a background music can be turned down while a spoken comment is played. New (experimental) Slideshow synchronisation dialog box for an easier placing the pictures along a timeline. The Picture Info dialog box (F7) has now a movable divider for adjusting the relative sizes of the comment and keywords/custom field areas. The Picture Info dialog box (F7) now works like the Transitions (F9) dialog box when more than one pictures are selected in the album. Transition duration is now included in the picture delay time. - New vertical panorama modes. New Keyword tab in the Album Info (F6) dialog box. Dynamic categories can be defined: pictures belong to a dynamic category if the given boolean expression is true. New "Copy pictures" command in the Picture menu to copy the selected pictures to another folder. New "Open containing folder" command: will open a Windows Explorer window showing the folder that contains the current picture.
. Quality preview: Use the real pictures instead of the thumbnails for the preview display (slower).
. Use picture preprocessor: Authorize a MAX picture preprocessor to modify the picture before printing ("Quality preview" must be set to visualize the effect in preview mode). In the Sheet Layout template editor, press Ctrl-C to copy the current area to the Windows clipboard and press Ctrl-V to paste a previously copied area to the template. Added the ability to disable the chrominance subsampling when saving JPEG files (improved quality when saving anaglyph pictures for instance). Improved multi-monitor support (MyAlbum, Viewer, ScreenSaver) New "Refresh monitor list" button in the Monitors tab.
. app.bJPEGNoChromaSubsampling: JPEG chrominance subsampling control.
. app.CopyString: Copy a string to the Windows clipboard.
. app.PasteString: Paste a string from the Windows clipboard.
. alb.EnsureVisible: scroll the view so the specified thumbnail is visible.
. picture.BrightnessContrast: Change the brightness/contrast of the loaded picture.
. fullScreenView.GetMousePos: Retrieve the current mouse position. New debug flag DEBUG_KEEPBADPIC (0x10) to keep the partially loaded picture (when picture file is damaged for instance). Self-running albums are now compatible with code-signing. Corrected: Using the "Open new window" or "Open new list window" options in the Find dialog when a Sheet Layout template view was open wasn't working correctly. Corrected: Search using custom field wasn't working in the Viewer. Corrected: crash on computer without any transition installed. New: MyAlbum is now able to play transition effects between picture during slideshow. Transition effects are available in the standard MyAlbum application, the MyAlbum Viewer and the screen-saver module. New experimental display modes for panorama pictures: smooth scrolling left to right or right to left of very wide pictures. New setup window for the Viewer: multimonitor and MAX extensions setup. Support for the WM_APPCOMMAND API (extended keys on internet keyboards like, play, pause, stop,...). Experimental stereo mouse cursor: click the mouse wheel along with (1) the Shift key for parallel or crossed viewing (2) Shift+Ctrl keys for red-cyan anaglyph viewing. Roll the mouse wheel to adjust the z position of the mouse cursor. New keyboard shortcut in full-screen view: press Shift-C to show/hide the full comment. New macros for the Display strings: %pT, %pt, %pa (see the online help for details).
. app.CreateObject: Create a COM object (internal use).
. app.ConvertString: Convert a string (to UTF-8).
. app.nTrackRectInfoType & app.nTrackRectInfoSize: type and size of the drawn over the cropping rectangle.
. picture.transitionID: CLSID of the transition.
. picture.sTransitionParameters: optional parameters of the transition.
. fullScreenView.ReloadPicture: Fully reload the current picture refresh the screen.
. fullScreenView.PlayTransition: Play a transition between two pictures.